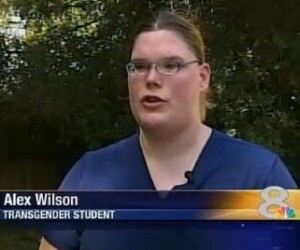 Transgender nursing student Alex Wilson says her school threatened to press charges and expel her if she used the women’s bathroom, TV station WFLA reported. Wilson, who has undergone four years of hormone therapy in her transition to female, was using the women’s room at Pinellas Technical Education Center in Clearwater, Fla., until another student complained this week, the station noted in the segment above. Wilson has been relegated to an isolated “closet”-sized restroom she said was degrading, per WFLA. Posted July 12th, 2013 & filed under News.